Random House Books for Young Readers, 9780679890485, 24pp. 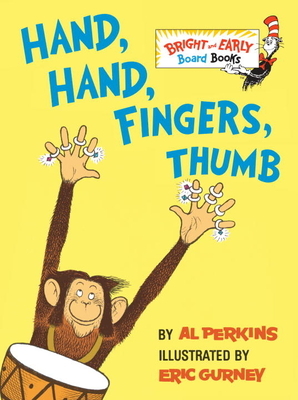 Al Perkins was the author of several Bright and Early Books and Beginner Books, among them Hand, Hand, Fingers, Thumb; and The Ear Book. Perkins passed away in 1975. Eric Gurney (1910–1992) was a well-known artist, cartoonist, and illustrator. Born in Canada, he later came to work for Walt Disney Studios in 1938, where he collaborated on Bambi and Pinocchio, among other films. He received a National Cartoonist Society Award for his work twice. He books include The Digging-est Dog, and Hand, Hand, Fingers, Thumb.